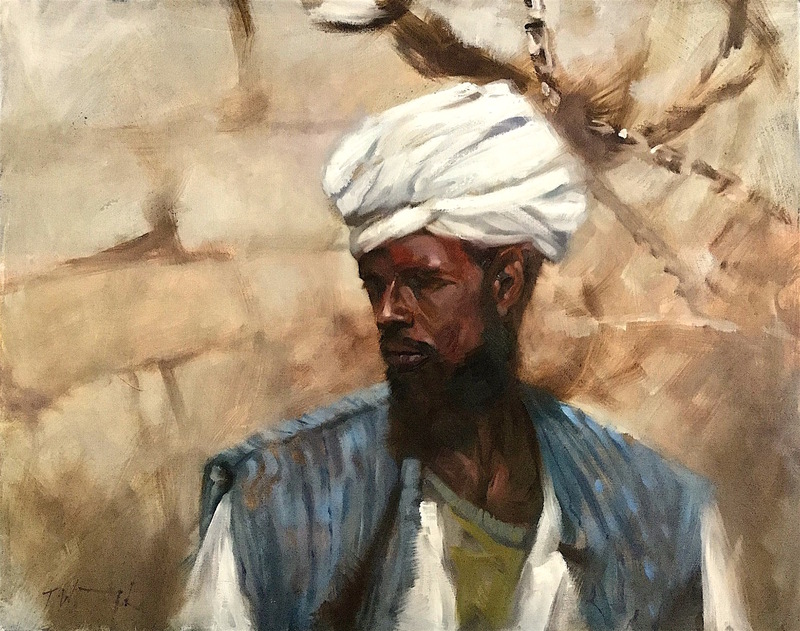 Camelman / Oil on canvas by International Artist Trevor Waugh. A large oil painting of an individual tending a camel, dressed in a white turban and blue tunic with heavy contrast from figure to background. The animal can just be seen behind the figure merging with a loose collection of stones that form a wall. A limited palette of colours accompanies a loose rendering of form in this dramatic eastern portrait. The dark tones of the skin and shiny highlights and black beard intermingle to create lost edges in the facial features, and this all accompanies the dazzling whites of the turban and shirt throwing the figure into relief. The size is 40″ x 30″ when unframed.